Collaborations between tech companies are nothing new, and in recent times we've seen companies like Facebook and MailChimp team up to make the lives of small business owners and digital marketers a lot easier. Digital companies live and die by their tech stack and the tools they choose to build with and integrate into their systems and processes. One tool that is often overlooked is project management tools. These dashboards help you organise tasks, keep track of deadlines and manage communication and feedback between stakeholders and teams. I've used many project management tools over the years, and I personally have a bias towards Jira, but that's not to say there aren't great alternatives. The problem with project management tools is that in a fast-moving business like eCommerce, for example, teams need to communicate with each other about work all day–often in real-time messaging tools. This communication needs to eventually turn into actionable tasks and moving information between your instant messaging service to your project management tool can be a pain and plenty of data can be lost in the process. This is why I'm pretty excited to see that one project management tool has seen this trend and put together a user experience that caters to it. 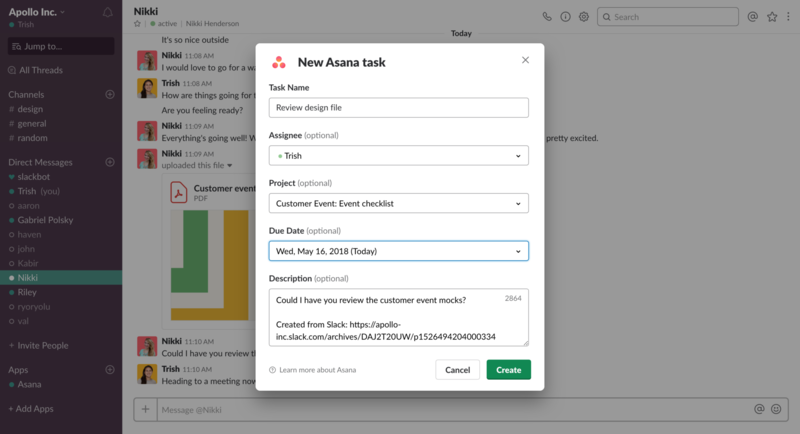 Asana has announced that it has partnered with Slack and the integration is now available. With this new integration, your team can get Asana updates in Slack, take action on those updates, and even turn Slack messages into Asana tasks or comments—without leaving Slack. When you turn your team’s Slack messages into tasks and projects in Asana, everyone will know who’s doing what by when—no matter which tool they’re using. Using the new actions menu in Slack, you can capture all the details of a new task: who’s responsible for it, when it’s due, what needs to be done, and what project it’s for–so nothing falls through the cracks. And you can also add Slack messages to existing Asana tasks as comments, so you keep important updates and context tied to the work it’s about. With the new integration, you can take action on Asana tasks right from within Slack. When you get an Asana notification, or a teammate shares an Asana task link with you, you can complete it, change the assignee and/or due date, add it to a project, or open it in Asana. You won’t need to switch between tools so that you can stay in your workflow. To Install the new Asana for Slack takes a bit of effort so Asana has created a step-by-step instruction guide on how to use this new integration. To get started, please visit the Asana Guide. Get more data on your email performance by pushing open rates into GA and consolidate your data into Google Analytics using event tracking.